LynchyRightNow: Ducks, Tigers, Horned Frogs, Oh My! This is the most exciting time of the college football season. You have programs clamoring for wins to make them bowl eligible. You have others looking to play spoilers to possible National Title contenders. Heisman candidates making their final cases. Time to get after it! #1 Oregon Ducks Oregon continued to flex their muscles this weekend. The top ranked Ducks improved to 9-0 through the Washington Huskies. Another 500+ total yard output, another 50-point game, what's left to say about Oregon's offense?!? They're flat out dominating. More so, I watched Stanford play Arizona this weekend. The Cardinal won 42-17, completely blowing out Arizona. That's the team that is going to knock off Oregon?!? With remaining games against Cal, Arizona, and in-state rival Oregon State, the reality of Oregon competing for a National Championship is becoming much more likely. #2 Auburn Tigers As rumours of Cam Newton's NCAA investigation swirled throughout Auburn last weekend, the Tigers put them in the rear view and smashed Chattanooga by 38-points. Exactly what this team needed in a distraction filled week. The same weekend which Auburn went to 10-0, SEC rival Alabama fell to 7-2 in Baton Rouge. Now Auburn's path to the SEC Championship Game gets slightly more simple: Beat Georgia, and you're in. Even with a loss against Alabama in the final week, as long as Auburn beats Georgia, they're going to the SEC Championship. Why is this important when it comes to the National Championship discussion? Because even going 2-1 between Georgia, Alabama, and the SEC Title game, could put Auburn in Glendale despite undefeated TCU & Boise State. #3 Texas Christian Horned Frogs What more can TCU do? At 10-0, coming off a 47-7 stomping of previously undefeated Utah, in their building, they're still #3. A conviction on the Mountain West Conference if I've ever seen one. Know this, Gary Patterson is a tremendous coach and the Horned Frogs 10-0 record is evidence of that, however that no longer matters. The polls are saying one thing week in and week out, it's not only who you beat, it's who the teams you've beaten have played. Auburn wraps up with Georgia and Alabama. Oregon wraps up with Cal, Arizona, and Oregon State. TCU, San Diego State and 1-8 New Mexico. Andy Dalton has had a tremendous season quarterbacking the Horned Frogs, but there is still a possibility that Dalton and the Horned Frogs might just get leap frogged by a 1-loss Auburn program if that were the case. #4 Boise State Broncos It's getting awfully chilly in Boise. The Broncos are going to be left out in the cold unless football Armageddon takes place. A 1-loss Auburn team, with their SEC strength of schedule, will take what they'd hoped would be their spot in the National Title game. 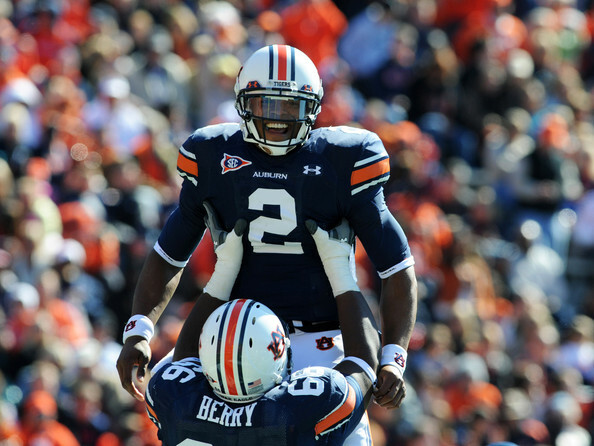 While the Auburn Tigers have yet to lose, they can still lose once and play spoiler to Boise. Furthermore, the previously discussed Horned Frogs, are getting the nod before eyes even turn to Boise. TCU's victory in week 10 against a previously undefeated, now 14th ranked Utah team, is the kicker. Both Boise and TCU have victories over Oregon State, and Virgina Tech's loss to James Madison is still looming large on Boise. Bottom line is, the Broncos are effectively being boxed out. Yes, I'd still take them on a neutral field against any team in the country, but my vote doesn't count. #5 Louisiana State Tigers World, meet your 1-loss darling. The Mad Hatter (LSU coach Les Miles) came out and said it best, "We have to get through our schedule, but I know this, we play everybody." 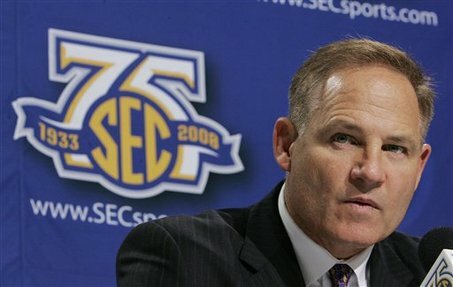 After delivering a standing eight count to Nick Saban and Alabama's shot at defending their National Title, Les Miles said what everyone was thinking; If you're going to claim TCU and Boise State deserve a shot at the National Championship, but a 1-loss LSU team with victories over Alabama, at Florida, vs. West Virginia, vs. North Carolina, and possibly at Arkansas isn't getting a shot, you better think twice. Can you blame him? A 7-point loss at Auburn two weeks ago could cost LSU a chance at the SEC Championship, and they're O.K. with that. The problem remains, the SEC programs are not going to be O.K. with a 1-loss SEC program being left at home while watching the Mountain West or Western Athletic Conference regular season champion play for the National Title, not by a long shot.